Jeovany Jimenez Vega, 30 November 2015 — The present migratory crisis, unleashed by the Nicaraguan Government’s refusal to permit transit through its territory for Cubans walking to the United States, has brought to the foreground a drama that has been going on for decades. Too many stories of suffering and death have spattered the dangerous route followed by tens of thousands of emigrants from the island going north through Central America. But what could have been a rapid solution of the problem at the meeting of chancellors of the Central American Integration System (SICA) which took place this week in San Salvador was frustrated by the intransigence of Daniel Ortega’s Government, obstinately opposed to permitting the caravan’s passing in spite of the good will shown by the majority of the governments in the region in handling the matter as a humanitarian problem rather than a question of national security. It’s not by chance that the present crisis generated, a few days ago, Raúl’s recent visit to México. On Aztec soil, the dictator was assured of blocking the last obligatory link of the stopover of these terrestrial rafters, getting from Peña Nieto’s Government — the same one that criticizes the U.S. when it deports Mexicans — its unrestricted commitment, beginning now, to deport any Cuban it encounters passing through. Scarcely days later, suspiciously, the governments of Costa Rica and Nicaragua also announced measures that were analogous. But the Costa Rican Government revised rapidly and authorized transit visas to the caravan, and later assumed a constructive posture when the Nicaraguans sent army troops to stop the attempt of these emigrants to cross the border. Things still remain at this point two weeks later. This dramatic situation of thousands of Cubans stranded in Costa Rica, like a shot centered even more attention in the U.S. on the justification or not of keeping alive the Cuban Adjustment Act, and intensified one even chillier polemic that, as never before in half a century, ended by putting this regulation on the dissection table of US policy. These are compelling questions that line up like daggers toward the center of the problem: would the abolition of this law stop the exodus of Cubans? Is that law really the essential cause of the perpetual flight maintained during decades by a considerable part of my people? What would happen if the Cuban Adjustment Act was repealed this very day? The matter seems to me as obvious as the question, “What color is a white horse?” I’m among those absolutely convinced that if the repeal of the law materializes this would only redirect the present exodus from the island. In case speculation turns into fact, it would produce only a momentary reduction in attempts to leave; but once the initial stupor is overcome, and spurred on by the real cause of their flight — the absurd hardships imposed by a Communist dictatorship — Cubans would continue arriving at their own rhythm in the United States, even under an illegal status — amply exemplified by Mexicans — since one river more or one river less would mean nothing to those who also are ready to row 90 miles and brave the sharks. Trying to reduce the motive for the stampede and the discriminating protection offered by the Cuban Adjustment Act would simplify the matter too much and would disavow the categorical fact that a quarter of the Cuban population remains dispersed outside the country; and if it is true that most live in the U.S., it’s also true that the Cuban diaspora has left barely any virgin space between both poles in its sustained and frenetic escape. Even if the abolition of the existing Cuban Adjustment Act led to another that was rigorously directed to the contrary, the exodus would continue as long as the present cause exists, which is the absolute lack of hope for Cubans — above all for the youth, of course — under a totalitarian regime, a dictatorship that has hijacked the future of their nation and traitorously curtailed any possibility of wellbeing for its people, that has systematically obstructed their prosperity and has submitted them to the most oppressive and unhealthy despotism that has ever been known in the American hemisphere. The latest news seems to presage a long wait for those stranded in Peñas Blancas: the lack of agreement of the good will of most of the chancellors meeting in San Salvador before the bad faith of Managua, in addition to the mentioned policy of extradition assumed by México, added to the new migratory policy announced by Ecuador of requiring a visa for Cubans beginning next December and the recent detention of hundreds of Cuban migrants in Panamá by the express petition of Costa Rica thus appear to warn them. The recent UN announcement of support for the Government of San José in its humanitarian attention to Cubans in Peñas Blancas and its intention to find a solution for the crisis – all are very illustrative evidence of the gravity and regional repercussions of the present migratory crisis. 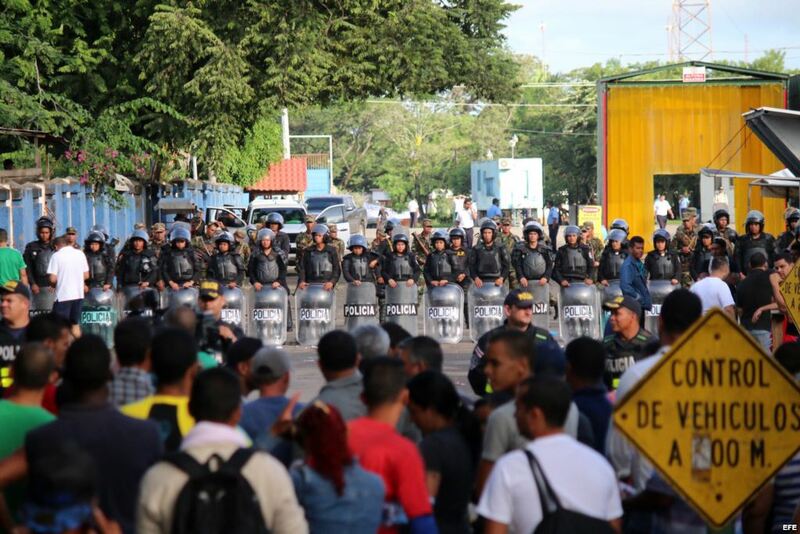 But in all this mess, what stands out above the rest of the elements is the intransigence of Daniel Ortega’s Government: the hermetic posture assumed by Managua is very striking. They have managed to stigmatize the Cubans on the Costa Rican border as being a mob of criminals, and they arrived at the ridiculous — in their desire to ingratiate themselves with their accomplice in Havana — by demanding that Costa Rica remove the Cubans from the border, because they consider them a danger to national security, even knowing that if they gave them passage the Cubans wouldn’t even stop for a drink of water, and not a single one of them would remain in Nicaragua after 24 hours. The unconditional acquiescence shown by Daniel Ortega — disguised as ultranationalism in the presumed protection of territorial integrity — is so shameful and boot-licking, and is strictly aligned with his servility to Havana’s directives. This chapter of the drama has shown America and the world that Cuba continues stuck in time as thousands of Cubans remain stuck in Costa Rica, living testimony to the despair of a people who now expect nothing of the dictators who misrule their country. All the ostensible reforms proclaimed by the regime of Raúl Castro are left unveiled as barren tinsel, and a shattering proof of that is the perpetual flight that never stops. The very late and biased official pronouncement of the Cuban Government on the subject — blaming, of course, the Cuban Adjustment Act for the disaster — and the scandalous indifference shown by the Cuban embassy in San José in regard to the irregular situation of those thousands of their citizens on Costa Rican soil are highly illustrative evidence that the Cuban dictatorship continues holding exactly the same arrogance and contempt as always for the rights of my people. The despotic message released by the tyrants in Havana loudly and clearly suffices as a warning to those dreamers who still hope to harvest some fruit from the tree.